No dogs, no barking, kitty litter completely changed whenever. We are a boutique cattery. The emphasis is on quality care, not being able to take numbers, so early bookings are recommended. Come and view our new contemporary styled units, designed so that in most cases your darling can’t even see other cats. Rent a single, double, triple or four unit. We have some units with outdoor lounges, ideal for long stays, with the added interest of sheep, birds, pasture and native bush. 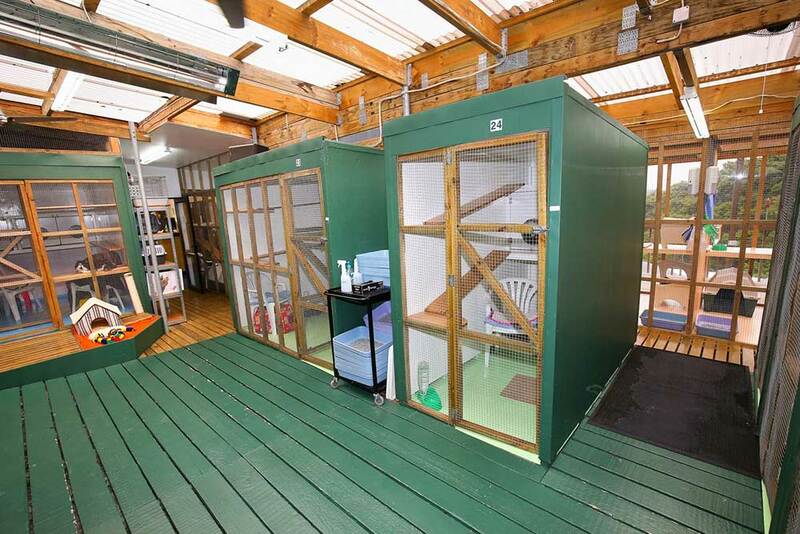 Our units are big and suitable for the largest families of cats. We do not confine our guests to sleeping boxes at nights. Everyone gets shelves, ramps, chairs or sleeping boxes. They all make interesting vantage points or comfy resting spots. We also have a special heated wing suitable for accident victims, very young, very old or those used to extra attention or the finer home comforts. We stock a large range of professional foods, including the prescription diets for kidney, tartar, weight, and bowel problems, bladder and some of the better supermarket food lines. Read about cat nutrition here. We are dedicated to presenting your cat back to you in better condition than it came in, if that’s possible.